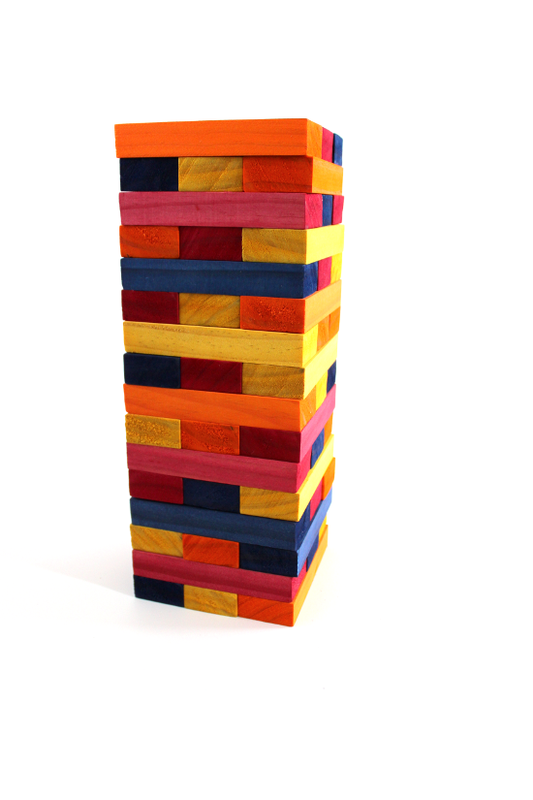 I think Jenga ought to be called a classic game, don’t you? However, if we’re going to start calling a game from the 80’s classic, we might as well start calling waterbeds and jams classic too. Or maybe not – it’s debatable. 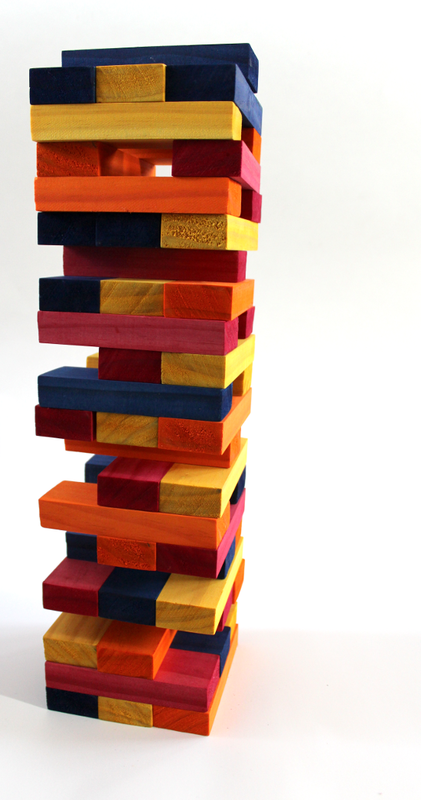 For a “classic” game like Jenga, you could find yourself spending as much as $25 or you could build your own for less than $10. 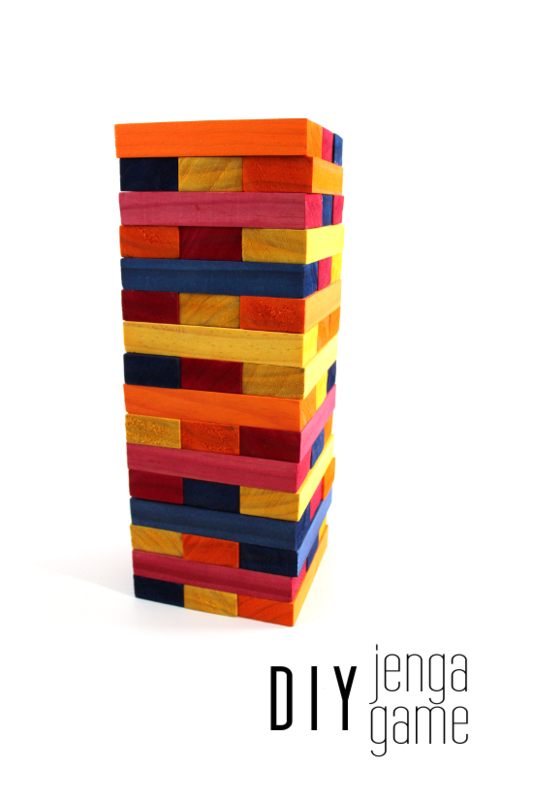 I’ve seen awesome giant Jengas, but to keep the price down I made a smaller one. 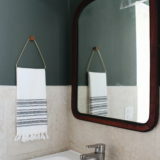 To make one, you’ll need two 1x2x8’s and one 1x2x6 wood boards. I used select pine from Home Depot. Out of those three boards, cut forty-eight 4 1/2-inch pieces. After all the pieces are cut, sand the sawed edges and slightly sand the corners so that they are smooth but not rounded. My dad was in town for Elijah’s birthday so I made sure to put him to work. At this point you are ready to play. In fact, we kept ours this way for a while. Eventually I decided to color them using Rit Dye. 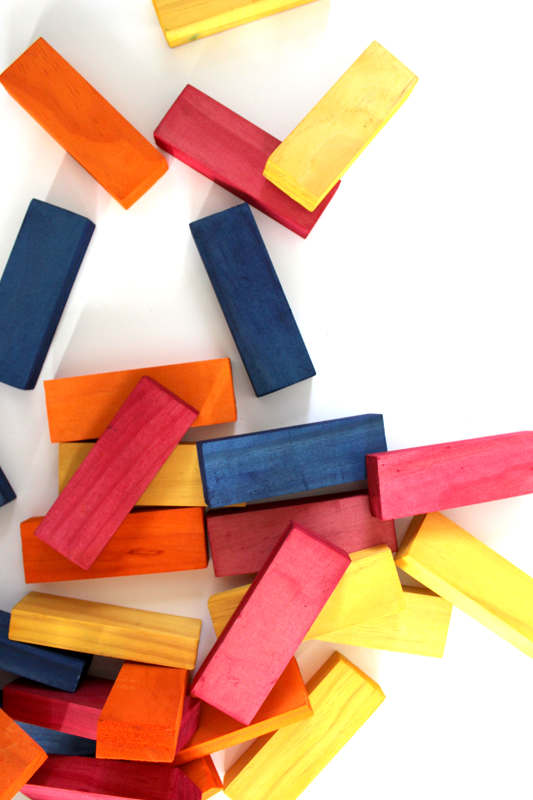 I bought four colors; scarlet, orange, royal blue and yellow and dyed twelve Jenga blocks at a time. To dye them mix some powder dye into two quarts of steaming water. I used a different amount of dye for each color, since they kept coming out darker than what I was aiming for. For the blue blocks I used the whole package of powder dye. For the orange and yellow, I used two tablespoons of dye per two quarts of water, and for the red dye I only used one tablespoon of dye. 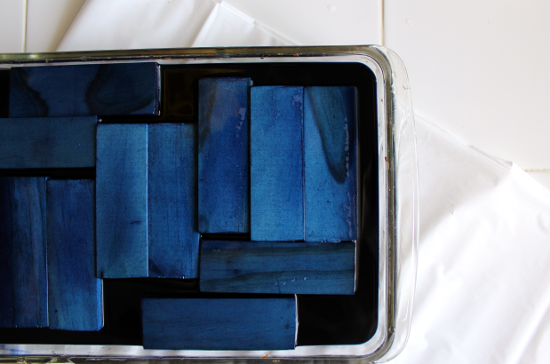 After thoroughly mixing the dye with the water, I set the blocks in the solution for 5 minutes per side (10 minutes total). Then, I removed them and let them dry on a paper towel. To prevent any dye from seeping through and onto the table, I made sure to set up a plastic tablecloth underneath the paper towel. I allowed them to dry for at least 24 hours before using them and I left them unsealed. They came out much more primary and less muted than I was hoping for but Elijah loves them – he’s actually commented multiple times about how good the colors look. So you can file this under “success”!